For over two decades, FMX has been a fixture in the CG industry. Originally a networking event for graduates of leading German film school Filmakademie Baden-Württemberg, it quickly grew to become Europe’s premier computer graphics conference, exploring the latest trends in visual effects, animation, games and transmedia work. This year, the show expands to embrace virtual reality and even audio design, with a stellar line-up of speakers that includes Oscar-winning VFX supervisor Rob Legato and former Pixar director Jan Pinkava. With so many amazing sessions on offer, the main problem for visitors to FMX is simply deciding what to see, so if you’re one of the thousands of artists heading to Stuttgart later this month, we’ve picked out 10 highlights of this year’s show. One of the key themes of FMX this year is virtual reality. The Blending Realities track runs across all four days of the conference, spanning everything from computational cinematography to new business models for VR work. But by far the best-titled of the sessions is Oh F***… I’m Iron Man, which chronicles director, VFX supervisor and VJ Daffy‘s own ventures into the new medium. In his talk, Framestore’s former head of 3D commercials will talk about his work with the studio to create the award-winning Avengers VR experience for Samsung’s new Gear VR headsets, ranging from the technical aspects of rendering work for VR to the psychological importance of defining the VR ‘self’ and the social responsibility involved in showing people VR for the first time. A key aim of FMX’s Blending Realities track is to assess the impact that the VR revolution will have on artists and directors. The panellists in the Storytelling in Virtual Reality session are better placed than most to comment, having worked on some of the world’s best-known animation and visual effects projects before moving to the new world of VR. Speakers include Jan Pinkava, director of Pixar’s Oscar-winning short Geri’s Game and co-director of Ratatouille, and now creative director of Google Spotlight Stories, designed to take 360-degree storytelling to a new audience; and Jacquie Barnbrook, producer of The ChubbChubbs (above), Sony Pictures Imageworks’ Oscar-winning short, now producing projects for The Virtual Reality Company. One of the coolest things about FMX is being able to discover how the visual effects of major movies were created only days after they hit cinemas. In The Virtual Production of Disney’s The Jungle Book, visual effects supervisors Rob Legato, Adam Valdez of MPC and Keith Miller of Weta Digital will discuss their work on Jon Favreau’s live-action retelling of Rudyard Kipling’s classic children’s stories. Neel Sethi plays Mowgli, the wild boy raised in the jungles of India – but the real stars of the show are the cast of photorealistic CG animals who make up his world, voiced by actors including Idris Elba, Bill Murray and Ben Kingsley, and whose creation will be explored as part of the Virtual Reality for Production track. FMX attracts some of the industry’s biggest stars, and 2016’s show is no exception. In the Directors, Technology and Storytelling session, DreamWorks Animation’s Jennifer Yuh Nelson – nominated for an Oscar for her work on Kung Fu Panda 2, and the first woman to solely direct an animated feature at a major Hollywood studio – will be taking part in a ‘fireside chat’ with Blue Sky Studios’ Steve Martino, director of Horton Hears a Who! and The Peanuts Movie, and Blur Studio’s Kevin Margo, who recently moved from VFX supervision on some of the world’s leading commercials and games cinematics to direct the acclaimed photorealistic short Construct (above) created using a pioneering real-time workflow. Concept art from The Hobbit created by Paul Tobin. Image courtesy of Weta Workshop. For concept artists, one of the biggest highlights of FMX 2016 will be the chance to see legendary matte painter Michael Pangrazio, responsible for the backdrops of some of Industrial Light & Magic’s most iconic movies, including the Hoth sequence from The Empire Strikes Back. In 2004, Pangrazio joined Weta Digital to work on Peter Jackson’s King Kong, and is currently the studio’s art director, working across projects including Steven Spielberg’s The BFG. In his presentation Concept Art at Weta Digital, he will be talking about Weta’s work and discussing how the techniques for developing concept art have evolved over the course of his career but the fundamental goals have stayed the same. For concept artists, another high point of the show will be The Art of Kung Fu Panda 3, in which DreamWorks Animation art director Max Boas will be talking about his work on the movie. A DreamWorks veteran, Boas began his career at the studio in 2003 as a background painter on Sinbad: Legend of the Seven Seas, going on to work on the visual development of Over The Hedge, Flushed Away and the original Kung Fu Panda. He will be joined by production designer Raymond Zibach, who cut his teeth on TV series including The Ren & Stimpy Show and Rocko’s Modern Life before joining DreamWorks. Separate sessions touch on the concept art of Zootopia and for PlayStation VR Worlds, so be sure to check those out. A unique feature of FMX is the Virtual Humans Forum, its long-running series of presentations on creating photorealistic digital humans. As well as tech sessions on topics including the accurate 3D capture of the human eye and the current state of the art in real-time work hosted by artists from Epic Games, the conference track explores how digital actors are being used in current commercial projects, including a session on Terminator: Genisys hosted by VFX supervisor Sheldon Stopsack, which reveals how MPC recreated Arnold Schwarzenegger to create the movie’s ‘young T-800’ character – a process that can be glimpsed in the studio’s breakdown video above. A new departure for FMX this year is the Sound Design track: a series of nine sessions spanning a range of audio-related subjects. It kicks off with a presentation on the audio post-production on animated TV series Lapins Crétins (above) – English speakers will probably know it better as Ubisoft franchise Raving Rabbids – before branching out to cover visual effects movies, aural illusions in virtual reality applications, and even the audio engineering of Imagine Dragons’ Smoke and Mirrors tour – the latter presented by veteran Monty Python collaborator André Jacquemin. Other tech sessions cover the art of foley work and an introduction to Dolby’s Atmos cinematic audio technology. Another world first for FMX 2016 is the debut of FilmEngine: the successor to Crytek’s Cinebox. A real-time virtual production system based on the company’s CryEngine game engine, Cinebox has been used on a range of movie projects including Dawn of the Planet of the Apes, CNCPT‘s previsualisation work for which can be seen above. Described by its creators as an “intuitive, pipeline-agnostic production tool optimised for virtual production workflows”, FilmEngine will present the Virtual Production Stage alongside its technology partners Ncam, OptiTrack, ARRI and AMD. According to the show’s organisers, “attendees will be immersed shoulder to shoulder with industry pros in a virtual production stage, working with the same state-of-the-art tools used by Hollywood directors”. 10. Land your next job! But FMX isn’t just about the conference sessions. 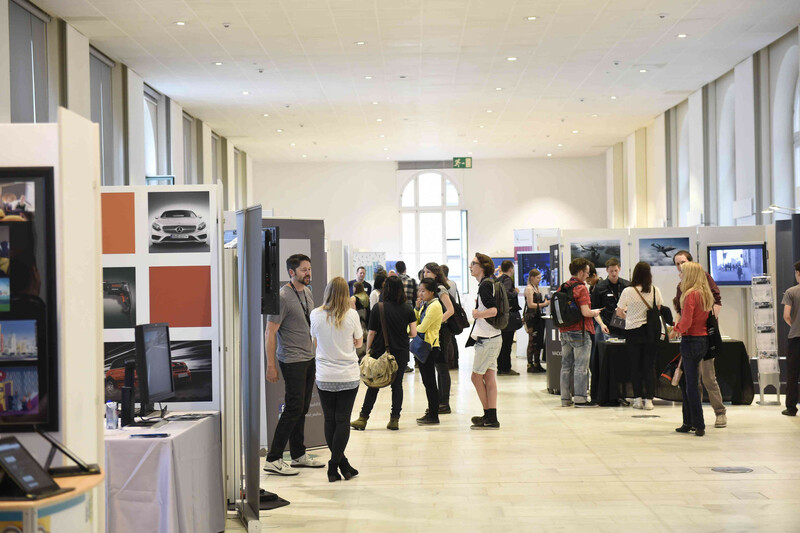 Outside the lecture halls, visitors to the show can tour the expo floor, attend tech sessions on 3ds Max, Maya, Houdini and Clarisse iFX, and take part in workshops hosted by the likes of Maxon, Chaos Group and Pixar. There will also be a chance to catch up on the best new animated shorts, in popular sessions hosted by DreamWorks’ Shelley Page and producer and curator Ron Diamond, and even a special screening of Captain America: Civil War. On top of that, the show could be your ticket to your next job in the industry: in FMX’s recruiting hub, leading facilities including ILM, Walt Disney Animation Studios, MPC, Double Negative and Framestore will be opening their doors to applicants. Be sure to pack your showreel. FMX 2016 takes place from 26-29 April 2016 in Stuttgart, Germany. A day ticket costs €190 and a four-day conference pass costs €380, with discounts for students.